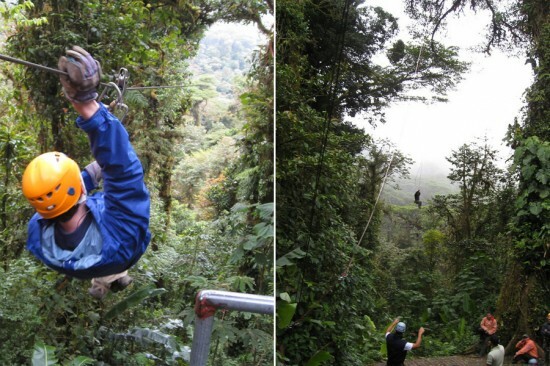 Do not miss these activities that will make you scream Pura Vida! This was a bit of a last minute, on- the- whim kind of trip. And since Q wasn’t coming along, not enough PTO days, I invited my friend Remy. G solo trippin’.. sort of. Costa Rica is surrounded by awesome natural landscape. 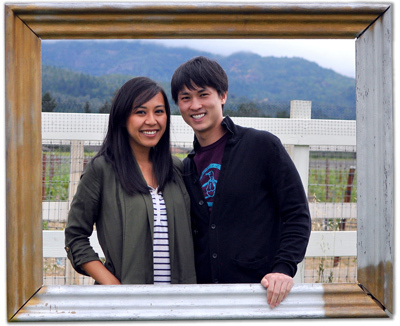 Besides boat cruises and hiking the trails, there are plenty of fun activities to do. Lucky for us, all included in our tour package! If you love the outdoors, here are a few things you could look forward to on a trip to Costa Rica! So many things to do in La Fortuna, but given that there aren’t many other places in the world where you can rappel down waterfalls, it was a no brainer! The trip starts with a 4×4 adventure that is plenty bumpy, so don’t eat too much prior to doing this activity. Then the group goes canyoneering through the lost canyon and rappelling down waterfalls (some almost 150ft) — one of the top highlights of my Costa Rica trip. What is canyoneering? I would describe canyoneering another form of extreme hiking down a jungle river. The tour guides weren’t equipped with cameras making me really wish I had a waterproof camera on this day. So to see it in action, we’ll have to make due with this video from Desafio. Monteverde in Costa Rica is having its cloud forest reserve filled with tons of plant species and exotic birds. But it also has its thrill-seeker side. With cable lines stretching 2+ miles over lush rainforest, Monteverde is Costa Rica’s best place to go ziplining and probably one of the best in the world! The Canopy Tour also concluded with a leap of faith rope swing into the jungle. Me getting hammered underneath a level 9 hotness waterfall! 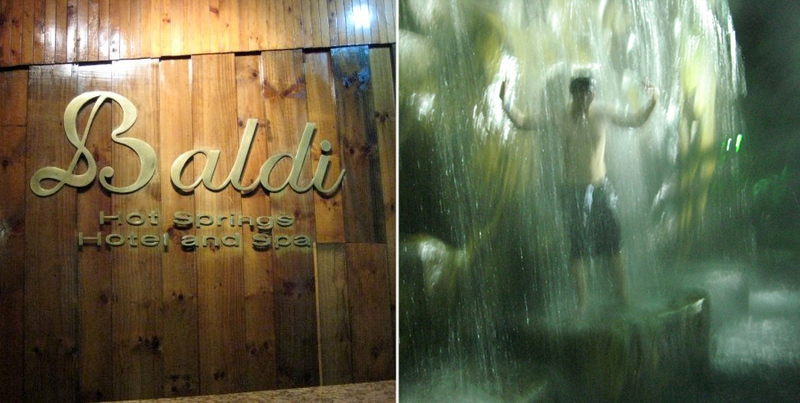 After a physical day of activities in La Fortuna, what better way to relax than in hot natural springs? Naturally heated by the La Arenal volcano, Baldi resort is a great option and a cheaper alternative to the other popular Hot Springs resort, Tabacon. It has everything you need, from laying beds in hot healing water to water slides and just plain relaxing in lush cascading hot springs. Caution: The higher you get up towards the peak, the hotter the water is. Travel Costa Rica covers essential tips you should know when visiting this fine establishment. Costa Rica has some of the most diverse wildlife in the world. I find animals very entertaining for some odd reason like that dog from the movie UP! and how he gets excited when he see squirrels. 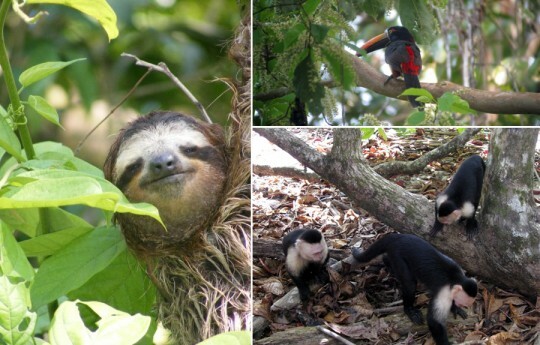 Manuel Antonio National Park is a great place to see a sample of Costa Rica’s wildlife. You’ll see everything form exotic birds to playful monkeys to lazy sloths! If you love the outdoors then Costa Rica is the place for you. All the activities above were arranged and coordinated by our Gap Adventures tour. But you can easily find local tour companies who can provide the same activities. I was able to zipline in Costa Rica, but am so disappointed that I didn’t know about rappelling down the waterfall. That looks amazing! Great post!! seems like you had a lot of fun!! Thanks Kalyn. It was actually much safer than it looks. And still a blast! I just did this trip recently and I’m probably one of the few people out there who will say that Costa Rica disappointed me. I expected a more vibrant culture and better food, but instead it was a series of expensive hotels/hostels, transportation, meals, and attractions. You might not have had as much frustration being on a tour, though. I love outdoor adventures as much as the next guy, but it was overpriced and overdeveloped. More history and culture, less Central-American Disneyland. I can see where it can be overdeveloped. It probably is pricier compared to other Central American countries. Since my tour leader has lived in Costa Rica for quite some time, we weren’t let down by the food suggestions. The only thing I didn’t like about CR was San Jose. But I knew that coming in since everybody told me don’t waste anytime in SJ. We did one night hike up La Arenal volcano I believe to see some lava flowing from the top. It was pretty hard to see, but you could see a little bit of it. 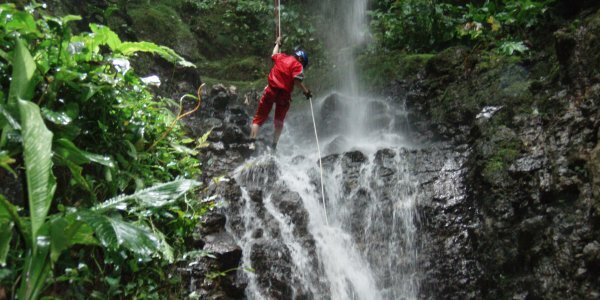 My Costa Rica Quest G Adventure tour offered all the activities, I just chose which one I wanted to do. Hmm… tips would be to just go with the flow and manage your expectations (meaning if the rain comes, embrace it and don’t let it dampen your day). Good luck on your first trip abroad! Costa RIca is super fun. We’re planning to do a volcano hike too, hopefully we’ll see lava as well! Super excited. Btw, how is the tap water in CR? I’ve read mixed reviews; some suggest drinking bottled and some said tap is okay as long as it’s filtered. What are your thoughts? Did you stay in hostels or hotels? How was the lodging there? Did 3 of your 4, loved’em!! Gotta get back for the hot springs in Baldi! Great post! Thanks Kyle! Love Costa Rica. Surfing! I took a lesson in Tamarindo and managed to ride a small wave on my 4th try. I would recommend EcoTermales in La Fortuna over Baldi. They limit the number of visitors to 100 so it’s never over crowded. It’s also more relaxing without a party vibe. The on-site restaurant is pretty tasty too.